Continuous positive airway pressure (CPAP) is commonly prescribed to treat sleep apnea, a condition diagnosed via a sleep study. The goal is to improve breathing at night, but how do you know if a treatment such as the CPAP is working well enough? The apnea-hypopnea index (AHI) can be a helpful measure to diagnose the severity of the condition at baseline and track the effectiveness of your treatment. What does the AHI reading mean on a sleep study or CPAP machine? What is considered an event? If the AHI number is elevated, you may ask, "How do I adjust my CPAP machine?" 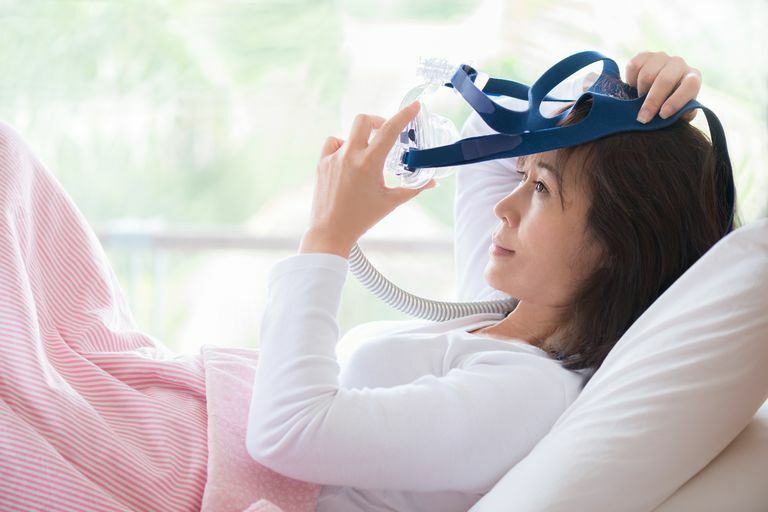 Learn what your goal AHI should be to maximize the benefits of using CPAP for optimal therapy and how the pressures are determined and should be adjusted. First, it is important to understand what the apnea-hypopnea index (AHI) reading means, both with sleep studies and on a CPAP machine. This measurement is often presented within the context of a sleep study report. It is the number of times per hour of sleep that your upper airway (tongue or soft palate at the throat) partially or completely collapses, leading to a brief arousal or awakening from sleep or a drop in blood oxygen levels. The partial collapse of the airway is called a hypopnea. The complete absence of airflow through the nose and mouth, despite an effort to breathe as measured at the chest and abdomen, is called an apnea event. The AHI is used to classify the severity of sleep apnea. This same classification is used to assess how well treatment, such as the CPAP machine, is working. Children’s sleep is analyzed with stricter criteria and more than one event per hour of sleep is considered to be abnormal. A sleep study (polysomnogram) is performed in a sleep disorder center and is typically used to diagnose sleep apnea. It is also possible for the condition to be diagnosed based on home sleep apnea testing. All of this information is analyzed to determine how many times you breathe shallowly or stop breathing altogether during the night. Any partial obstruction of the airway is called a hypopnea. Hypopnea refers to a transient reduction of airflow (often while asleep) that lasts for at least 10 seconds. Shallow breathing or an abnormally low respiratory rate may be called hypoventilation. A complete cessation in breathing is called apnea (from the Greek meaning "no breath"). Hypopnea is less severe than apnea (which is a more complete loss of airflow). It may likewise result in a decreased amount of air movement into the lungs and can cause oxygen levels in the blood to drop. Sleep apnea is more commonly due to partial obstruction of the upper airway. In order to count in the AHI, these pauses in breathing must last for 10 seconds and be associated with a decrease in the oxygen levels of the blood or cause an awakening called an arousal. These awakenings may fragment sleep, make it unrefreshing, and lead to daytime sleepiness. There are some sleep facilities that use other measures to assess this degree of severity. The respiratory-disturbance index (RDI) may be used if a measurement of airway resistance with a pressure esophageal manometer is also included in the study. The oxygen-desaturation index (ODI) attempts to calculate the number of apnea or hypopnea events per hour that lead to an oxygen drop of at least 3 percent. This is thought to be important in assessing the risk of long-term cardiovascular (high blood pressure, heart attack, and heart failure) or neurocognitive (stroke and dementia) consequences. The AHI will be used to help select the most appropriate treatment. The use of continuous positive airway pressure (CPAP) is appropriate for mild, moderate, or severe sleep apnea. In contrast, the use of an oral appliance may be limited to mild or moderate sleep apnea. Surgery may be selected based on risk factors related to your anatomy. Positional therapy may be suggested if your sleep apnea is worsened by sleeping on your back. Other treatments may be recommended, depending on the level of AHI that is observed with your sleep study. Therefore, it is not useful to chase a daily number. Rather, these variations should be averaged out over 30 to 90 days. In general, the AHI should be kept at fewer than five events per hour, which is within the normal range. Some sleep specialists will target an AHI of one or two with the thinking that fewer events will be less disruptive to sleep. If the baseline AHI on the sleep study is quite high, such as 100 events per hour, even 10 events per hour may represent a significant improvement. These types have unique resolutions. For example, the CPAP pressure may need to be turned up—or down—or the mask may need fitting or replacement. The optimal goal for you may depend on the severity and nature of your initial condition. It may be tempered by your compliance with treatment, with lower pressures allowed to improve comfort. The best pressure setting for you is best determined by your board-certified sleep specialist with the average AHI used in the context of your experience with the treatment. Modern CPAP and bilevel machines are able to track the residual number of breathing events occurring at your current pressure setting. Each of these events could correlate with a brief awakening or a transient drop in the blood oxygen level. You may believe that using your CPAP will prevent the condition entirely, but this is not necessarily the case. It depends, in part, on the pressure set by your sleep specialist. Imagine trying to inflate a long floppy tube by blowing air into it. With too little air, the tube will not open and it will remain collapsed. Similarly, if the pressure is set too low on your CPAP machine, your upper airway can still collapse. This may result in either persistent hypopnea or apnea events. Moreover, your symptoms may persist because of inadequate treatment. It is also possible that other variables will affect the amount of pressure that is needed to keep your airway open, as noted above. Newer machines can track your residual abnormal breathing events and generate an AHI. This may be accessible on the device or via associated tracking websites or apps. How is this accomplished? Well, the short answer is that these methods are proprietary, confidential, and are not disclosed by the companies who make the devices. In simple terms, however, consider that the machine generates a constant pressure. It can also generate intermittent bursts of additional pressure. It then measures the resistance within the airway to this additional pressure. If there is no clear difference in resistance between the lower and higher pressures, it is understood that the airway is open. However, if the airway is still partially (or even completely) collapsing, the additional pressure may encounter resistance. In “auto” machines, this will prompt the machine to turn up the pressure within the prescribed range to better support your airway. Remember that this measurement is not as accurate as that which occurs in a formal sleep study. The measurement may be compromised by a high mask leak. If it remains elevated without a good explanation, it may require a repeat sleep study to assess your condition. The AHI that the machine calculates is then recorded on the compliance data card. Your equipment provider or physician can then download this and generate a report to direct your treatment. It also may be displayed in the morning on the device’s screen or user interface. This information can also be shared to the cloud and provide you with information about the effectiveness of your therapy with related programs. As previously mentioned, there are a number of variables to consider when interpreting the AHI reading. It may not be resolved by simply turning the device's pressure up or down. The needed amount of change may also be complicated. For example, someone with a high AHI on a sleep study may not necessarily require a high CPAP pressure to resolve the condition. Anatomy and other factors may have a role. If the device is turned up too high, it may cause central sleep apnea to occur. If the settings are too low, it may not work well enough to resolve the condition. If the AHI remains elevated, it is time to return to your board-certified sleep specialist for an assessment. Your provider can interpret the AHI in the context of your baseline sleep study, anatomy, medications, change in health status, and other factors. This person should be the one to adjust your CPAP machine's settings. Though the settings can be changed by anyone, only your provider can make an informed decision. If surgery is performed or an oral appliance is fabricated to treat sleep apnea, a test may be repeated to ensure the treatment has been effective in resolving the AHI. If you have questions about what AHI means to your condition and whether your CPAP is working as well as it could be for you, contact your board-certified sleep medicine sleep physician to discuss your status and the options available to optimize your therapy. Regular follow-up in a clinic will ensure that your treatment is a success. "Common AHI Definitions." FAQ, Philips Respironics DreamMapper. Giles, TL et al. "Continuous Positive Airways Pressure for Obstructive Sleep Apnea in Adults." Cochrane Database Syst Rev. 2006; 3:CD001106. Kryger, M.H. et al. "Principles and Practice of Sleep Medicine." ExpertConsult, 6th edition. 2017. "Why does my apnea-hypopnea index (AHI) change?" ResMed.